This second volume in the Thai Pop Spectacular series brings together regional artists from across Thailand. Some were modest pop players of their time, while others were major stars. 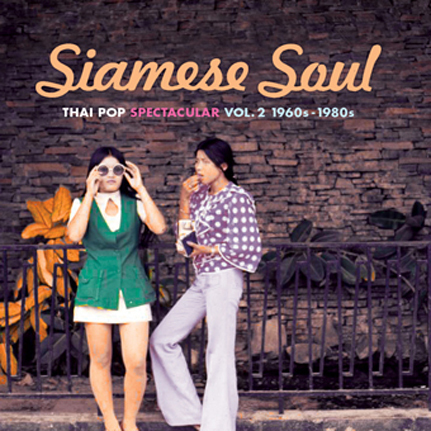 Siamese Soul features 1970’s hard-grooved roots funk, hypnotic Luk Thung tracks from the Northeastern Thai countryside, 1960’s rock & roll and 1980’s groove anomalies. All cuts come heavily laced with electric organs and guitar, thick horn sections, the traditional khaen, driving bass and stunning vocal performances with a richness that can easily be called Thai soul music of the highest order. These creative sounds formed by hybrids with Western instrumentation and genres, result in an incredibly dynamic music that is distinctively Thai. Selected from cassette tapes and vinyl found buried on bottom shelves in rural locales, these tracks serve as further evidence of a vital Thai pop scene that’s been kept from Western ears for far too long. This CD comes with a 16 page booklet of amazing exclusive photos documenting the era with translated song titles and liner notes by Mark Gergis and Alan Bishop.